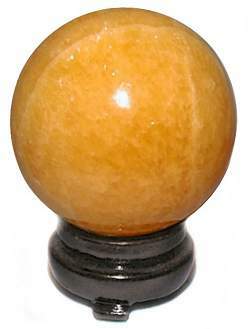 Bring home a bright sunny day with this gorgeous Orange Calcite Sphere from Mexico. Calcite crystals are highly bi-reflective, that means light is reflected in two different directions. This property gives Calcite a semi-translucent sheen with sparkling reflections. Highly polished and good color sphere comes with a Walnut Finish Oriental Stand. "Calcite is a world teacher for all of humanity, facilitating macrocosmic awareness and appreciation of the creative forces of nature"